IDF Amputee Still Determined to Serve - Breaking Israel News | Latest News. Biblical Perspective. 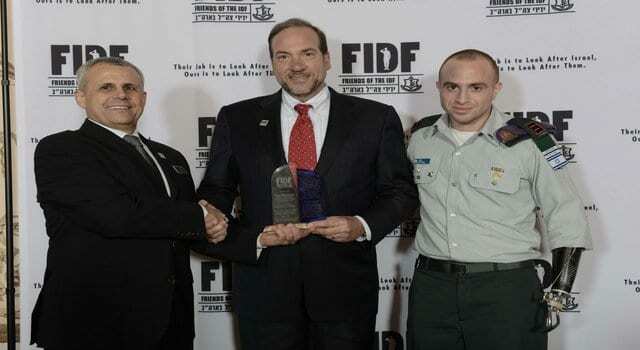 IDF Captain Ziv Shilon was honored at a recent Friends of the Israel Defense Force dinner in New York. Two months later, he returned to the US at the invitation of two FIDF supporters. Shilon lost his left hand and the use of his right hand in Gaza in October of 2012. Now Morris Silverman and Lori Komisar want to see if the Rehabilitation Institute of Chicago can help him fulfil his dream of returning to active duty. Shilon was a battalion commander in the Givati Brigade, commanding 150 men, when he was injured. The battalion was checking the area of Kibbutz Kissufim for explosives under poor visibility. An explosive detonated beside him after he left his force, fearing sniper fire, and tried to open the kibbutz gate. Silverman and Komisar heard his story at the FIDF dinner and were moved by his dedication. They wished to use Komisar’s connection to the Rehabilitation Institute to see if he could be fitted there for a better prosthetic, or even regain some use of his other hand. The FIDF was started in 1981 by a group of Holocaust survivors, and supports soldiers and their families through educational and well-being programs, financial aid, academic scholarships, Lone Soldier programs, programs for families of fallen soldiers, and more. Despite his injury, Shilon wishes to return to the army. “Defending the state of Israel is a need that still burns inside of me. It’s the noblest goal one can devote one’s life to, and I do not regret it for a moment… I really hope it will be possible,” he said in an interview with JNS.org.